Lancelot Lewis Earl was born in 1862 at London, England, son of Lancelot Earl and Elizabeth nee Lewis. 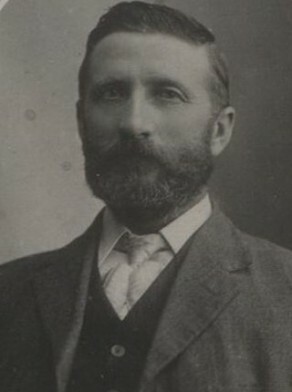 He married Ann Edwards at Wollongong in 1886. He died at Arncliffe on 20 June 1938, aged 76 years. Ann Earl died 10 December 1952, aged 88 years. After arriving in Sydney in 1883, Earl worked as a policeman for three years, and then worked as a wholesale fruit agent from 1886 to 1913 when he retired. The Earls moved to Arncliffe before the war and later Lancelot Lewis Earl became chairman of Central Starr Bowkett Society. He was a member of Rockdale Council from 1924 to 1937, president of Arncliffe Citizens Association and trustee of Arnclife School of Arts. In 1907 Earl urged the speed of trams in Glebe Road between St Johns Road and Mitchell Street be moderated as the suburb’s main artery, especially on ‘Saturday evening was crowded with people, many of whom had to cross from one side to the other at great risk’.